A couple of weeks ago, Gregory J. Ryan, author of a new children’s book about Thomas Merton, e-mailed to ask if I’d be interested in reviewing his book, The ABCs of Thomas Merton: A Monk at the Heart of the World. So he asked his publisher, Paraclete Press, to send a copy to me. It arrived late last week. And I’ve been enjoying it ever since. 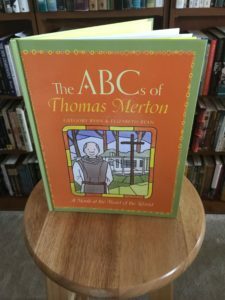 The ABCs of Thomas Merton is literally that – a children’s picture book that tells the story (one letter at a time, beginning with “A”) of Catholic monk and contemplative Thomas Merton. The writing is lively and informative. The illustrations, supplied by Gregory’s wife Elizabeth, are fun and engaging. Thomas Merton was a Trappist monk, an artist and a writer. He was born in France, but lived most of his life in the United States. His parents, Ruth and Owen, were also artists. After college, he felt that God was calling him to love the world by living a life of prayer. He joined a monastery in Kentucky so he could live, pray, and work with other monks. With his brother monks, Merton learned to love God, the earth, and all people. He became a monk at the heart of the world. With those 93 words setting the stage, Gregory opens with A is for Abbot, and ends with Z is for Zen. Granted, Gregory uses some letters multiple times (two B listings, two F listings, two G listings, three P listings, etc. ), but not because he needed to pad the book; rather, because, frankly, how do you tell the tale of Thomas Merton’s life using just 26 letters once? He even managed to use the letter X – something author Sue Grafton apparently wasn’t able to do in her alphabet-themed mystery series. Instead of using a letter followed by “is for” – as in A is for Alibi – her 24th book in the series is merely called X. We highly recommend The ABCs of Thomas Merton, which you can buy on Amazon here. NOTE: It doesn’t officially release until June 10th, according to the Amazon web site.